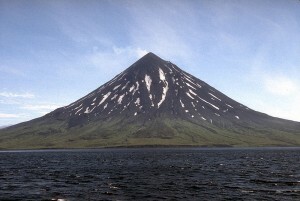 Travel chaos may ensue in the coming days for those journeying between Asia and the United States, as the Alaska Volcano Observatory has raised its alert level for Mount Cleveland, an active volcano comprising most of the Aleutian island of Chuginadak. While remote, the island volcano lies directly below a major international flight path – if Mount Cleveland blows, hundreds of flights may be cancelled or travellers may be redirected to their destinations via southern connections. Chuginidak is part of the Four Mountains, a subgroup of the Aleutian chain that trails from the south east tip of Alaska across the Bering Sea, approximately 1,500 km from the state capital of Anchorage. 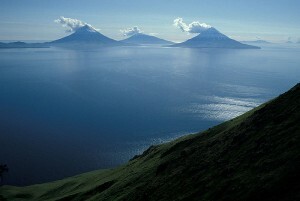 While numerous islands are included in this group, the eponymous Four Mountains all are active volcanoes, appearing as a quartet of picturesque peaks rising steeply out of the sea. The uninhabited Chuginadak is the largest in the chain, and, with its volcano covering most of the island, may also be the most geologically active. 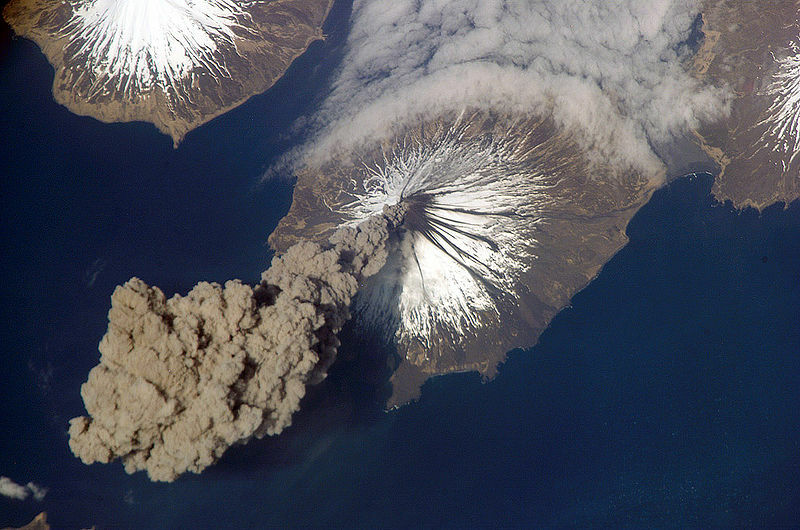 This wouldn’t be the first time that Mount Cleveland has erupted in recent memory – the island’s very name means to “fry” or “sizzle” in the indigenous Aleutian language, referring to a mythological “fire goddess” thought to live in the crater, suggesting that local inhabitants have long been aware of the island’s fiery potential. As recently as 2001, the volcano experienced a major eruption where lava spilled from the crater’s mouth and a cloud of ash was blown more than 8km high, and smaller signs of life were shown in 2009 and 2010. The volcano is also the only in Alaska to claim a fatality – a soldier stationed in the area during WWII disappeared during an eruption, and was assumed to have been killed. While no flights have been altered at this time, the Alaska Volcano Observatory has warned airlines that the volcano could erupt at any time, and to make contingency plans in case of disruption. The past two years have demonstrated just how much important it is for airlines and government authorities to be well-prepared in case of uncooperative volcanoes – a spate of eruptions by an Icelandic volcano in 2010 resulted in a week-long shutdown of flights, stranding tens of thousands of passengers and, according to the New York Times, costing airlines hundreds of millions of dollars.